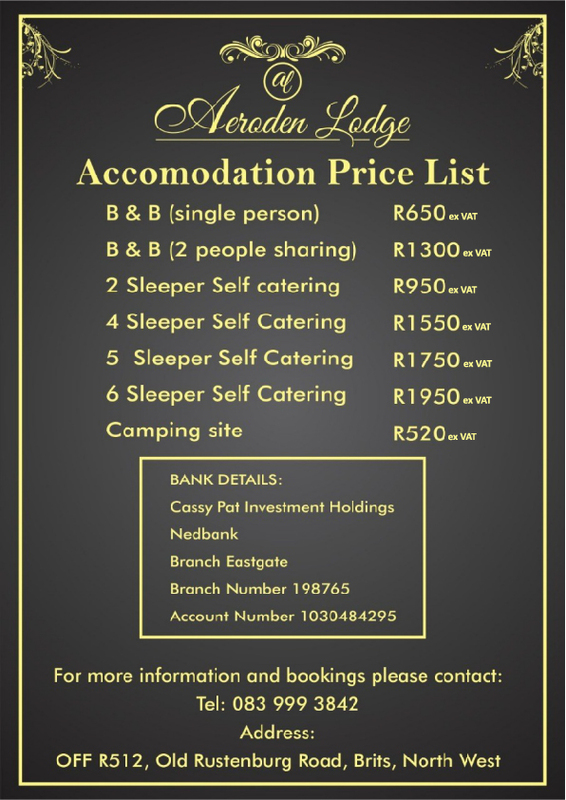 Enjoy our variety of self-catering accommodation. We offer bed and breakfast rooms, 2 sleeper chalets, 4 sleeper chalets, 5 sleeper chalets, 6 sleeper chalets and caravan and camping accommodation. The chalets have fully equipped kitchens, bath towels with complimentary soaps and gels. Guests are only ask to bring their own swimming towels. The chalets are all close to the swimming pools and all have their own braai facilities. All rooms are self-catering chalets come with DSTV. We have nine rooms with your choice of twin or double size beds. Each room has coffee making facilities, fridge, DSTV bouquet, air conditioning and bathroom on suite. The rooms are situated next to splash pool in a lovely secluded garden area. Besides breakfast we invite guests to bring their own picnic basket and use the communal braai area which has plenty of seating and is close to the swimming pool with a lovely view during the day and especially in the evenings. We have two sleeper self-catering chalets with one bedroom, bathroom on suite, kitchen and lounge and DSTV with hotel bouquet. You have your own veranda with portable braai. We have four sleeper self-catering chalets, with two separate bedrooms, one bathroom on suite, one with double bed, both sharing separate bathroom. Lovely large veranda with a portable braai. DSTV with hotel bouquet. We have five sleeper self-catering chalets, with two separate bedrooms, one bathroom on suite, one with double bed, both sharing separate bathroom. Lovely large veranda with a portable braai. DSTV with hotel bouquet. We have large lovely thatched six sleeper self-catering chalets each with Three separate bedrooms, bathroom on suite, and two convertibles singles, a separate shower and outside shower. Chalets have lovely large verandas and built in braai facilities with build in BOMA area to seat at the fire at night. Braai facilities overlook the microlight runway for a lovely view. We have six large camping sites each one separated with wooden poles for complete privacy. The sites have their own ablution facilities with shower, toilet etc and an outside tiled wash up basin. The sites overlook the large swimming pool and water slide to make it easy to keep an eye on the children.